Asus ROG Phone is a special launch for India, gaming enthusiasts. Asus ROG Phone launched in the united state last month has been launched in India. Flipkart Exclusive is offering many offers on the sale of this phone. The phone has been introduced in 8 GB RAM and 128 GB internal storage variant. Asus's gaming smartphone Asus ROG Phone has launched in India. The gaming phone company Republic of Gamers (ROG) took the phone off the phone. This phone has been introduced in 8 GB RAM and 128 GB internal storage. The company has joined Flipkart for the sale of the phone. The sale of the phone has also started. Asus's gaming ROG introduced the phone for the first time in the Computex event in June this year. Asus ROG Phone is priced at Rs 69,999 in India. 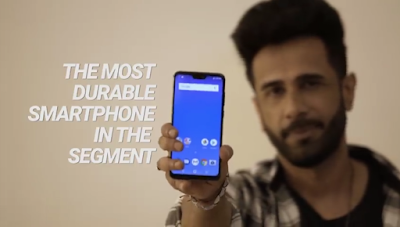 It has already been told that the phone is Flipkart Exclusive Phone. Reliance Jio is offering a cashback of Rs 5,000 and 4 GB of data every day on a phone with a 509 rupees plan. There is also no cost EMI, debit card EMI option for buying the phone. Also, 5% additional rebate will be given on payment by Axis Bank Billing Credit Card. Apart from the phone, accessories of the equipment accessories have also been revealed. The price of a professional dock is Rs 5499, the price of Joey Stick is Rs 5,999, Twin View Dock costs Rs 21,999 and ROG phone cost is Rs 2,499. Asus's gaming phone works on the Android OSO 8.1 based ROG gaming UI. The phone has a 6-inch full HD + Amoled display. Its resolution is 1080x2160 pixels. A typical phone is a custom Snapdragon 845 processor in the phone that comes with Qualcomm Adreno 630 GPU. The phone has 8 GB RAM. Talking about the camera, there is a dual camera set up in the rear of the phone. It has a 12 megapixel Sony EMX 363 primary sensor and 8-megapixel secondary sensor with F / 1.7 aperture. The phone comes with an 8-megapixel sensor for the selfie. In India, 128 GB of internal storage variant has been introduced. The fingerprint sensor has been given in the back of the phone. In the case of connectivity, the phone has been given WiFi, Bluetooth 5.0, USB Type C port, NFC and 3.5mm jack. Accelerometer, ambient light sensor, compass, gyroscope sensor proximity sensors are given in the handset. There are two types of ports given on the phone. The phone has a 4000 mAh battery, which supports Quick Charge 3.0 and side ports from the upper part of the phone to Quick Charge 4.0 technology. The company claims that the battery of the phone can be charged 60% in 30 minutes. Dimensions of the phone are 158.8x76.2x8.6 mm and weighing 200 gms. The phone has a game Cool Wrapper Chamber Cooling System. Along with this, the Aero active cooler has been given to avoid a heating problem. There is a mobile desktop dock that will give desktop gaming experience to the user. Apart from this, the gaming experience is given in the phone for the gaming experience on the big screen.